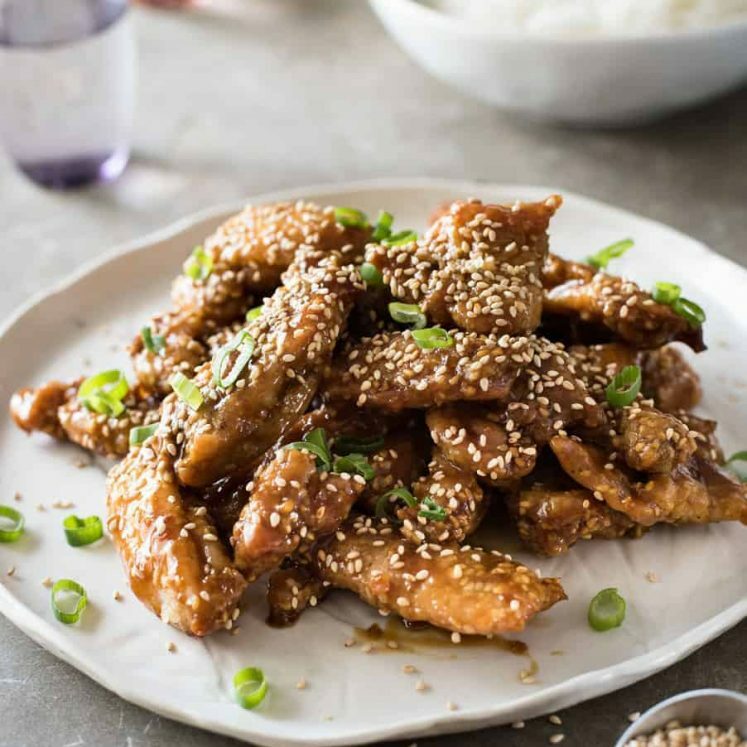 Easy crispy oven baked Chinese Chicken tossed in a sticky honey sesame sauce. 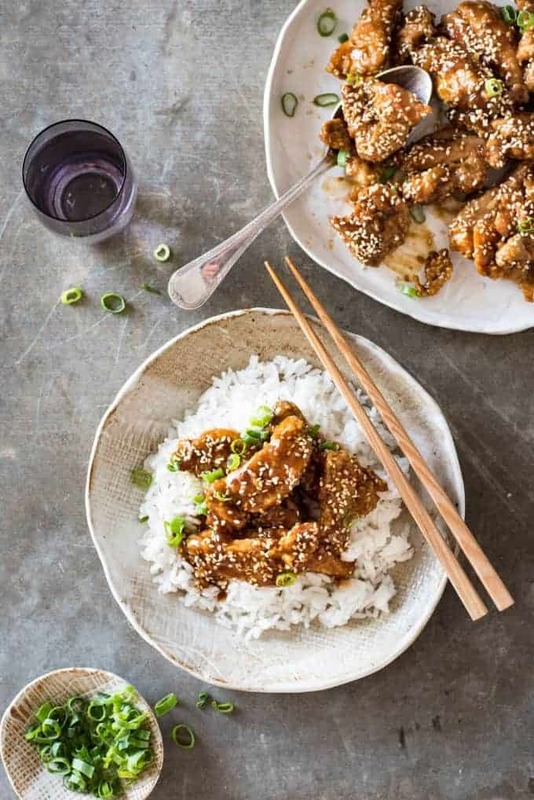 Who needs takeout Honey Sesame Chicken when it’s faster and so much healthier to make at home? To this day, I remain perplexed why Honey Sesame Chicken hasn’t made it to our shores. Along with Kung Pao Chicken, which still isn’t huge here though I have seen it on the odd menu in Chinatown. I mean, crispy chicken tossed in a sweet salty sauce loaded with sesame flavours. Hello. Australia. What is wrong with us? 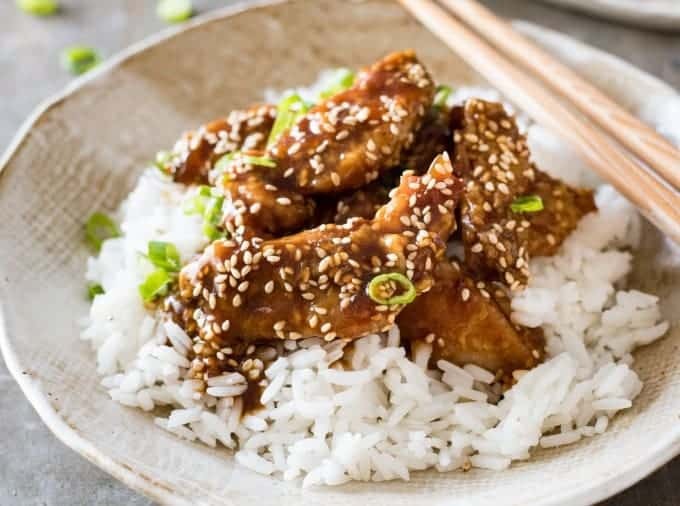 We need to start a Honey Sesame Chicken Revolution. 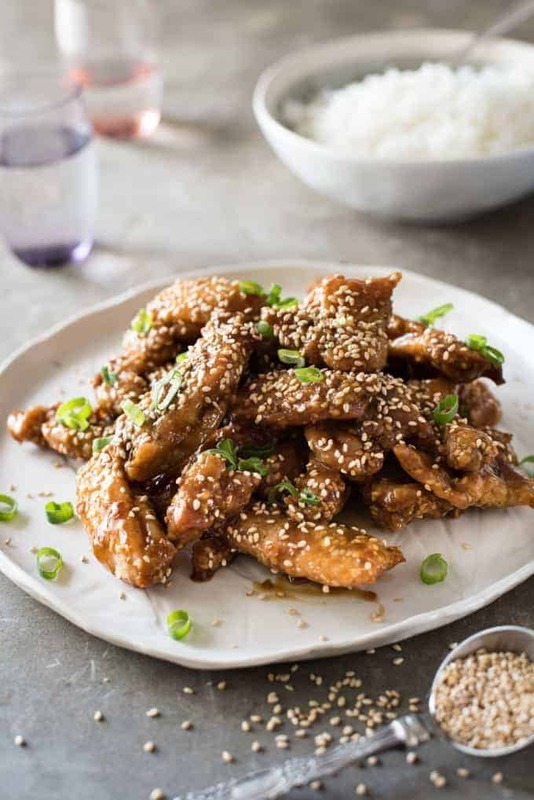 Honey Sesame Chicken is usually deep fried which gives it a lovely crunchy coating. I don’t deep fry for midweek meals. Too much effort, too much mess, and my waistline can’t afford it. 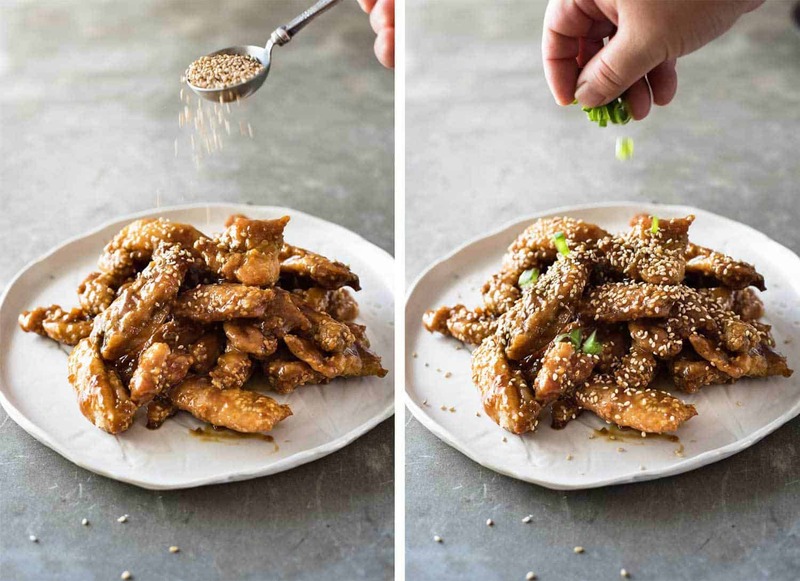 So this is how I make Honey Sesame Chicken for a midweek meal – by baking it. MOST of the crunch. All of the flavour. Don’t you think this looks lovely and crispy?? 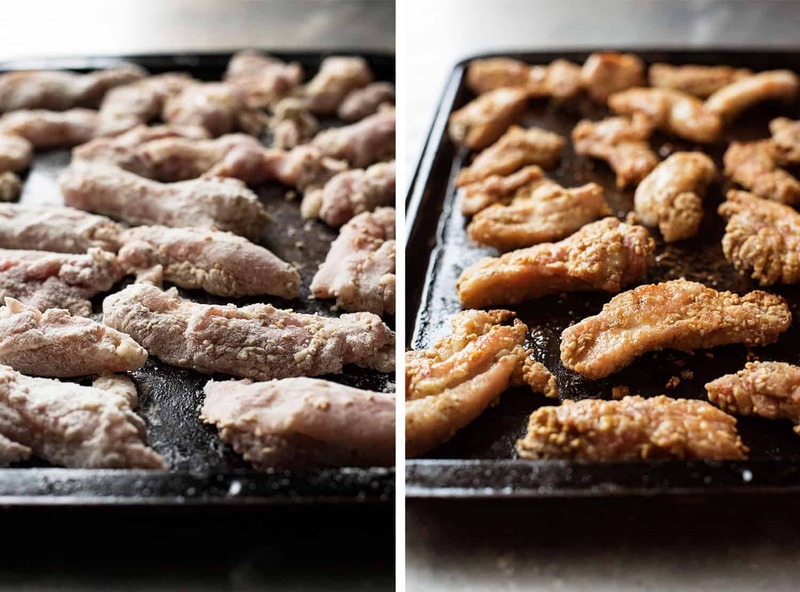 One key thing I do to make this nice and crispy – I use chunky strips of chicken rather than small pieces. This way, I can bake and broil/grill it long enough to make it crispy without the chicken shrivelling up into miserable dried chicken. Then you toss it in the gorgeous sticky sauce…. This recipe has the ultimate validation – from a member of my family. On the other hand, we have my family – mother, brother and sister. Always respectful, always appreciative when someone cooks. But…..we definitely don’t hold back if we have….erm….. thoughts. ? Trust me, it goes both ways. I give it as good as good as I get it! So yesterday (Sunday), my sister happened to drop by and I sent her home with takeaway containers filled with this Honey Sesame Chicken as well as Kung Pao Chicken (coming soon!). That evening, I got a text. Gasp! My rice, dry? Offensive. And so began a string of fiery text messages back and forth about the rice. Preheat oven to 200C/430F with shelf placed on the highest level. Spray baking tray with oil. Mix sesame paste and soy sauce in a bowl (to loosen it up, easier to coat chicken). Add chicken, salt and sesame seeds. Place flour in a separate bowl and coat chicken in flour, shaking off excess. Place chicken on baking tray. Bake for 12 minutes. Remove from oven. Flick to broiler/grill as high as it will go with shelf about 15cm/6" from the heat source. Turn chicken. Broiler/grill for 5 minutes until golden and quite crispy (Note 4), then remove. Meanwhile, mix together Sauce in one bowl and Cornstarch in another. Heat oil in a wok or skillet (I used a skillet) over medium heat. Add garlic and cook for 30 seconds until fragrant but not browned. Add Sauce and bring to bubble. Add Cornstarch and cook for 30 seconds until it thickens into a thick syrup. Remove the Sauce immediately from the stove and pour over the chicken. Toss chicken in Sauce then sprinkle over Sesame Seeds and Shallots/Scallions to serve. Serve with rice. 1. The chicken is sliced rather than diced so that way they are larger pieces that dry out during the cooking period. I use chicken thighs because they are juicier than breast. It can be made with breast but the flesh will be slightly drier. 2. Sesame paste is a Chinese ingredient that can be found at Asian grocery stores. I honestly cannot tell the difference between it and Tahini (the sesame paste used for hummus). PEANUT BUTTER is also an adequate substitute. I promise! It adds a bit of nutty flavour and acts as the same binding agent. 3. Please do not use LIGHT or DARK soy sauce. Use an all purpose ordinary soy sauce. I use Kikkoman. You will know it is an all purpose one because it won't have "light", "dark" or "sweet" soy sauce on the label. Light soy sauce is too salty for this dish and the flavour of dark soy sauce is too intense. 4. Fact is, baking chicken will not be as crispy as deep frying. But it's far healthier and it is still crispy! If you want to go all out, use the same coating but deep fry the chicken in oil. For extra extra crunch, fry it twice. 6. 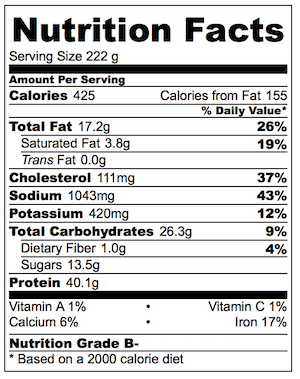 Nutrition per serving, assuming 4 servings. Rice not included. This is the fifth recipe I’ve used on this blog and they’re all incredible. I moved to Israel and I’ve missed American Chinese takeout and this was absolutely perfect. Thanks for all the amazing recipes. We made this last night. The sauce is absolutely divine. 10/10. We have made a few of your recipes now and they have all been brilliant. How is it I’ve only just discovered your blog?!?! It’s like we are spirit animals. It seems like I have found someone whose love for French toast rivals my own. And you’re Australian too! This was meant to be! Loved love loved the flavours. Only suggestion: I did find it difficult coating the chicken – I used Peanut Butter. So I actually heated the Peanut Butter until it became runny which seemed to help the coating process. All in all, the flavour, including the sauce was really delicious and we all loved it ! I also made the Cheesecake, including berries on the weekend as a belated birthday cake for my husband who had been working all week. Guess what ? It lasted approximately a day and a half until the plate was licked clean ! BEAUTIFUL!!!!!!! ??? absolute success. My partner said it looked and tasted like a restaurant dish. 10/10. I love that!!! It was crying out for rice once I saw it cooked with all that lovely sauce and I had some leftover fried rice luckily! So I microwaved that and it was a lovely feast. Mm. Your Asian slaw. I don’t know if I should leave separate post. It was fantastic! I actually made two bowls one with store bought coleslaw dressing as i wasn’t sure my partner would like the Asian dressing. He ate ALL the Asian dressed salad. And he had it packed for his lunch today!!! I was so pleased it’s nice to see his tastes evolving a bit. Lovely recipes!!!!! Absolute winners. Sesame chicken is my new favourite. I used potato starch to thicken it – i found it at the Asian store. It’s really cool – do you use it? (Just want to hear your opinion) ?????? Oooh – WOW!!! He took the Asian slaw for lunch??? Talk about evolved tastes, I’m so pleased to hear that! Thank you so much for letting me know you loved it! I do use potato starch on occasion, for Korean pancakes and actually, for other Korean recipes too 🙂 It’s great!!! It makes it even crispier than using cornstarch! You Austrailian/British girls make me laugh when I read your recipes! Here in the “States” we only have white, yellow, or red (Purple) onions! When someone says brown onions, we all think of “browned onions” which is pretty much caramelized onions. This recipe & your meatball recipe looks wonderful though, can’t wait to try them both, and thanks for the giggle!! Oh dear! I do know that, I keep forgetting to mention that brown, white and yellow onions will work fine for most of my recipes! I will update the recipe. I made this for dinner tonight. Yum! I was amazed at how crispy and not floury the chicken came out. The oil in the tahini must have worked from the inside out. I cooked the sauce in a cast iron pan that was clean, but had previously been used to cook enchilada sauce. The good news is that the sauce didn’t taste like enchiladas, but the heat of the cayenne was present in the sauce. I highly recommend a tiny bit of cayenne or a little Siracha sauce. It added another element. But it would have been outstanding without that too. Thank you Peggy, I’m so glad you enjoyed this! Thank you for letting me know! Thanks for this recipe ! I know what you mean about restaurants not listing this dish. I think it’s because most Chinese/Asian restaurants seem to all have the same basic menu (unless you go to Chinatown) ….. I can virtually name all the dishes in my head. They also seem to be told that Aussies don’t like spicy food and only to use traditional Aussie vegetables and mild flavours ! This might have been true 30+ years ago but a quick look in any supermarket will show the prevalence of Asian vegetables, condiments and ingredients. I used to live and work in Xi’an, China and I so miss the real food of China ! Woah! that must’ve been quite an experience! Thanks for this great recipe ! I know what you mean about restaurants not listing this dish. I think it’s because most Chinese/Asian restaurants seem to all have the same basic menu (unless you go to Chinatown) ….. I can virtually name all the dishes in my head. This is going to be our dinner tomorrow night. Looks so easy and quick to cook. I can’t wait to sink my teeth into the crunchy chicken! 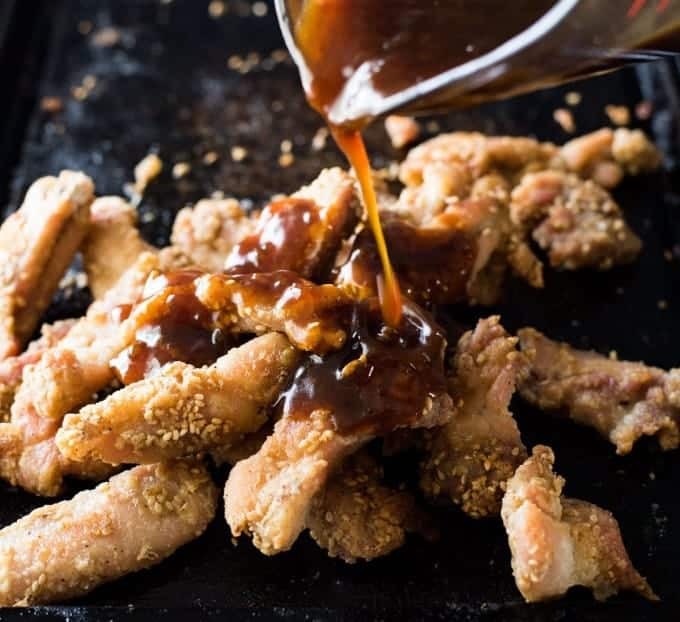 We love Kung Pao Chicken in this house – I have been cooking a couple of Kung Pao Chicken recipes from other sites, and J Daddy loves the salty and slightly spicy sauce as much as I do. We can’t wait to see your recipe! I’ll report back once I’ve made this dish. Yum awaits! Oooh….I await in anticipation!!!! PS J Daddy likes the sichuan peppers??? Changed our menu plan – cooking this later this week, largely because I finished work so late last night. Had your Satay Chicken Noodle Salad instead – soooooo good! Oh no!!! Are you working late often??? Maggie, so nice to see you here! I was just browsing your site the other day to learn more about real Chinese cooking 🙂 I can’t WAIT to try the eggplant!!!! This is so delicious. The flavor melts in your mouth. I want to take a bite out of m computer screen! Your baked chicken and the delectable sauce is going to be my new go to recipe for the boys. Quick, easy and simple. You would not find a dish like this in HK either, not just Australia. Lets start a new trend! You, me, let’s head up this sesame chicken revolution!!! ?? Thanks Muna!!! I think the key is cutting it into larger pieces 🙂 Keeps it nice and juicy! Awww, thanks Sarah!!! Well look, if it’s one of Spork’s fave dishes, we mustn’t deprive him, hmmm??? 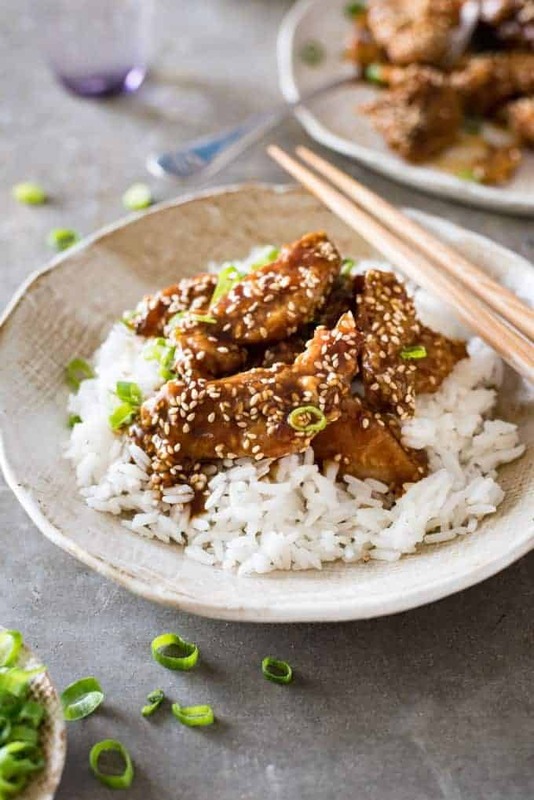 Your sesame chicken looks succulent and yummy! Thank you Balvinder!! It WAS very succulent – no overcooked dry chicken in my kitchen!? Looks like a meal my family would love too. Looks wonderful! I totally agree about mid-week frying! Not for me! And LOL on the whole rice thing. As easy as rice is, I always struggle to get “perfect” rice! I still can’t believe she critiqued my rice. My mother would murder me if I couldn’t cook rice properly!? WOO HOO!!! I’m always so excited to the first report when someone makes this!! I’m so glad you enjoyed this Celeste, THANK YOU for taking the time to come back and let me know!